The holidays were approaching, yet another specialty medication wasn’t panning out in the way we had hoped, and I found myself in a full-blown Rheumatoid Arthritis flare, longing for any kind of relief from the pain. I called my Rheumatologist to report on my condition and his instructions were, “Lay low and be patient. We have to wait three months before your insurance will accept another change.” Reluctantly, I agreed to restart my pain meds, even though prednisone plays havoc with my emotions, as it was the only relief available for the moment. God, where are you? And why are none of my usual coping methods acceptable any longer? I used to be really good at “walking it off” when my mind filled with darkness, and the satisfaction of a job well done could lift my eyes away from my problems, giving me a jolt of hope that maybe my problems weren’t so all-consuming after all. But now? There was no walking or chore or service that my body would allow. Caring for my basic needs took every available ounce of strength. The low point came when I looked at the calendar. Thanksgiving was only a few weeks away. We love when our adult children and their families gather at our home. We cook and eat our way through a day of feasting and fun, but this year something had to give, there was no hope I could prepare for that kind of gathering. So we all agreed to meet at our favorite restaurant and eat our Thanksgiving Dinner gathered around a public table, squeezed into booths and tables shoved together. The laughter flowed, the kids were too loud, and Grandpa’s “Dad-Jokes” made us all roll our eyes. No one was disappointed. Except for me. I still had not allowed my heart to find the change that God offered me. Did I follow her advice or sit in the corner and sulk, because I couldn’t make all the cookies and decorate all the rooms and craft all the gifts the way I was used to? Well, I had moments of contemplating that, but thankfully I heard a more precious Word from my Lord that caused me to change my perspective. Even if our movements change and our tasks shift, the GIVING of our FATHER is always a constant. He has more to give us than just another way of coping. He is to be depended upon and will bless our days – painful or whole – with GIFTS of His choosing, always with GOOD in mind. Bettie can be found in a small town in rural Southeast Wisconsin, where she lives with her husband of 39 years. You can find her blogging at BettieGsRAseasons.com where she is seeking to be transparent with the journey that God has her traveling with Rheumatoid Arthritis, Fibromyalgia, and Osteoporosis. Thank you so much, Joy, for your encouraging words! Yes, those offers of help can be such a beautiful grace-gift from our Father, when we open our eyes to see them for what they are, can’t they? I know that those old ways and routines hold a sweet place in our hearts, but our Lord has new and sweet places here too. I’m so thankful for these new connections and help that God has opened up through these digital places! –Blessings and hugs, my friend! 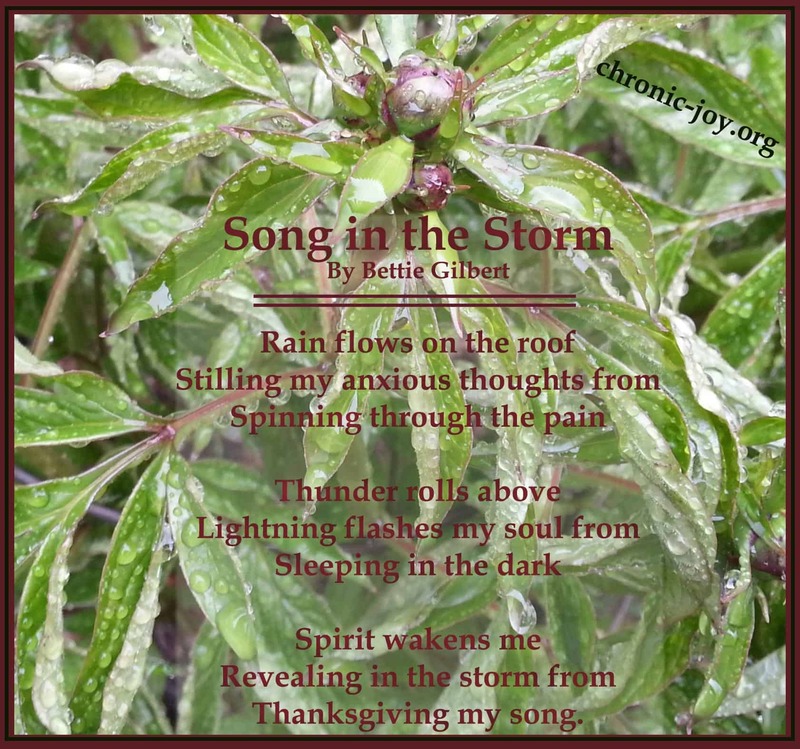 Thank you Cindee for allowing me to be part of the story-sharing that happens here at Chronic-Joy! I have been so blessed by the encouragement and strengthening in the Lord that you offer! May the Lord continue to bring about His Glory and Grace through your ministry here. Oh my, I love this post and the gentle beautiful way God created newness in your pain. You have followed my blog for sometime now and encouraged so much! Though I do not know your journey, I was touched by your processing through the holiday season and how God works to remind us that changing the way we do things during hard times is ok. Oh I needed to here this today! Thank you for your kind words Wendy! I have been so encouraged by the way that you have openly shared your heart through the journey that God has taken you, so I am blessed that you found encouragement here today! Our Lord is so good to bring us connections in His Body that lift us closer to His Heart. I am so thankful for the gifts of Grace that Chronic-Joy Ministries have held out for us who are walking through hard days. We really do need to hear each other’s stories! Bettie, your words are always full of hope and love for our Savior. I’m so glad your friend helped you be willing to accept the gift that your daughters so lovingly wanted to give. It is hard to give up things we love to do, but God is faithful to provide. As you said, “Even if our movements change and our tasks shift, the GIVING of our FATHER is always a constant.” Amen to that. Amen, sista. Sometimes it is hard to let things go but God wants us to so others can be blessed. Enjoyed your blog-your sista over at #livefreeThursday with Suzie Eller. Hi Kelsey, Thanks for visiting here! Yes, God is so good to send those to us who can share in the blessing with us when we receive from them. Thank you for your encouraging words! –Blessings!